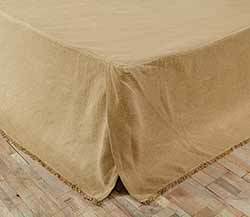 Burlap Natural Bed Skirt, by Ashton & Willow. We are offering bed skirts on a special order basis for those interested in adding on to their quilt purchase. This is for the Burlap Natural skirt - a natural tan colored loosely woven "burlap" cotton fabric. Available in Twin, Queen, or King Size. 100% cotton. SPECIAL ORDER ONLY. Columbus Pillow Cases, by Ashton & Willow. 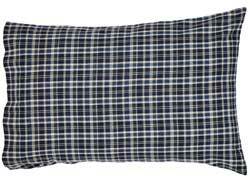 These pillow cases are 100% cotton in a green and navy blue plaid. Each Pillow case measures 21 x 30 inches. Pillow Cases are sold as a set of 2 pieces. Columbus Quilt, by Ashton & Willow. The Columbus Collection features a collection of plaid fabrics in navy blue and green with stitch in the ditch quilting in a log cabin pattern. This is for the King-sized quilt. Measures 105 x 95 inches. 100% cotton shell and fill. Machine pieced, hand quilted. Columbus Quilt, by Ashton & Willow. 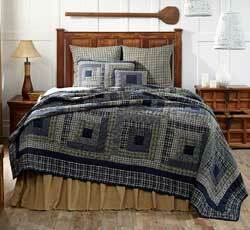 The Columbus Collection features a collection of plaid fabrics in navy blue and green with stitch in the ditch quilting in a log cabin pattern. This is for the Luxury King-sized quilt. Measures 120 x 105 inches. 100% cotton shell and fill. Machine pieced, hand quilted. Columbus Quilt, by Ashton & Willow. The Columbus Collection features a collection of plaid fabrics in navy blue and green with stitch in the ditch quilting in a log cabin pattern. This is for the Queen sized quilt. Measures 90 x 90 inches. 100% cotton shell and fill. Machine pieced, hand quilted. Columbus Quilt, by Ashton & Willow. The Columbus Collection features a collection of plaid fabrics in navy blue and green with stitch in the ditch quilting in a log cabin pattern. This is for the Twin-sized quilt. Measures 68 x 86 inches. 100% cotton shell and fill. Machine pieced, hand quilted.